Gregory is taking a historical practice, like Cubism and blending it with iconic personalities that have shaped popular music and film culture. Cubism is unassuming. Look at an image created with Cubism and you can see the cubes. Only straight lines are involved to create the image. This technique dates back to the early 1900's when Picasso and Braque jointly invented Cubism. Cubism is rooted in the math of geometry. Let us review a little math, shall we. A space figure or three-dimensional figure is a figure that has depth in addition to width and height. A space figure having all flat faces is called a polyhedron. Cubes and pyramids are both space figures and polyhedrons. A cube is a three-dimensional figure having six matching square sides. Now that the math refresher is over, let�s touch on the three broad types of Cubism which are analytical, synthetic and cubist sculpture. Analytical Cubism is a strict form of avant-garde art where an image is separated into various monochromic cube sizes and then reassembled creating an image. Synthetic Cubism uses everyday found objects like magazine clippings, movie tickets, photographs, receipts, etc to create not only cubes but new shapes that make an image. It is similar to a collage. Until this point art was made by using brushes and paint and for first time items like glue and scissors were considered art tools. This was revolutionary. Finally Cubist Sculpture is the marriage of similar shapes, cubes and pyramids, and the material used to create sculpture like bronze. 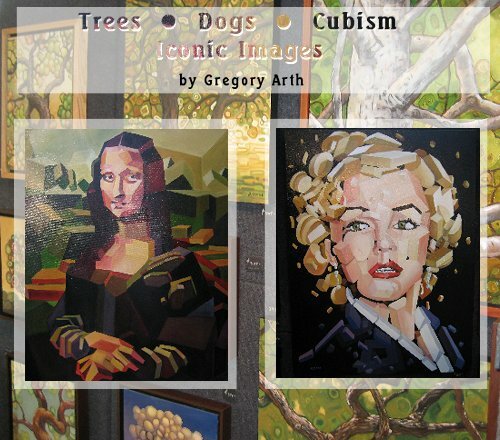 In the conversation, Gregory Arth explains how his study of Cubism influences his art. Renata What is your name? Gregory I prefer oil over acrylic. Occasionally I do some acrylic under painting. Renata Why do you prefer oil over acrylic? Gregory They tell ya�ll its not � it�s not true. But it has a richness to it (oil) that I like. And I like the dry time. It gives you more options to extend out and blend better and stuff like that. And the oil glazes that I use give a richness to it that I don�t think � it�s not the same as acrylic. Renata Ok. How long have you been painting? Gregory Since, I was a child, very young. I have old pictures from first grade of drawings I did that aren�t too bad actually. Gregory I�ve been a freelancer about 30 years now as a freelance artist. Gregory A lady came in and said I�ll take it. I said really. Ok. So, yeah, Jimmy�s been real popular. And the young kids know Jimmy Hendricks amazingly know him well. No music and know of him and some people just have this aura where they seem to transcend time almost. They don�t want to seem to go away. Renata What? What timeless piece? Who�s the subject matter? Gregory Well one of the more timeless � I have is actually keyboard looking piece. Gregory I use that. I use paint brushed still on the canvas and its real drippy and wet looking and that I created in the early 80�s and I have demand right now. I have to create a set this summer. I�m going to do 25 more that have different music on them. They are all original pieces but they have different music, a lot of classical music and some modern music. I chose the music for its visual look not its sound. Gregory But those pieces have always been in demand. I couldn�t do enough of those. It�s the weirdest thing. I tried to limit it. Gregory I�ve left a few blank at the bottom. They had one lady wrote music and then we out it on the piece. Gregory Each one is a custom piece. They have similar look is called the �Paint It Again Sam� series. Gregory Which is a kind of a play-on-words from the old Casablanca thing. Renata So what would you say your inspiration for � I know music is one. You are inspired by music and you created a music series. But what does your other inspiration come from? Gregory Well it�s hard to say. Curtiss It�s more of a feeling? Gregory I�m visual. I get inspired by visual things. Renata What type of trees are they? Gregory They�re oak trees all of those. But I have since branched out and I looked for them when I travel and find trees that I like and stuff like that. Curtiss Is it natural, the cubism, this is cubism right? Gregory I call it sculptural cubism. It started when I was studying cubist style and then started playing with cubist style. Traditional cubist style and then as almost a joke as tongue and cheek. I decided to use cubes. Gregory And the cubism, it was like �ha, ha� and look at this. But you know then I started going oh this is kinda cool. And everybody has already asked me, what it is [then] until I finally decided. And sculptors especially like it. So it led to me calling it sculptor cubism and I would like to try it in 3D. But it�s complex. Gregory I haven�t quite figured out how to do that yet. Gregory It would be interesting. Curtiss To charge quite a bit more. Gregory Yeah it would be big. It would be a huge deal. We kept toying the idea. Some computer guys keep talking [about] creating it in the computer. Then you can play with it and working it toward reality somehow. But I hadn�t had time. It�s going to be a complex project. I need a grant or something (laughter). Renata Is there anything you like to add? Gregory And as soon as you leave I�ll have all these great quotes. Curtiss Nah, it�s really is a good interview. Gregory I will say I enjoy painting a great deal and I live by art and I tell people its like eating and breathing. I have to do. I just have to do it. It�s just one of those things. You know, I just enjoy it too much not to do it.